I swam south toward a snorkel boat this morning in hopes of finding clearer water in which to swim. I got to the boat and, nope, not much better visibility; so I headed back north. I wasn't sure, but through the gloom of murky water I thought I saw a large shape swim past. Yep, there it went again. 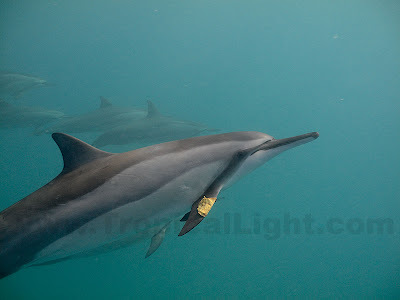 Hooray, Spinner Dolphins! 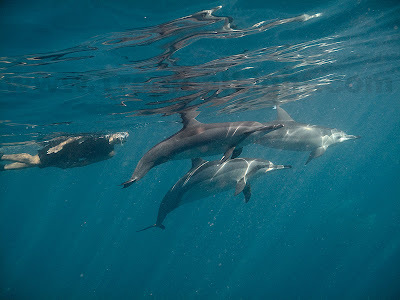 Playful Spinner Dolphins. They were playing the leaf game. They catch a waterlogged tree leaf on a fin, nose or tail and carry it. Then they drop it, move off, and rush back to pick it back up before anyone else gets to it. A couple of times a leaf was dropped near me but they always beat me to it. I guess I better work on my underwater speed. Two other swimmers joined me, but shortly after the dolphins headed off. Click HERE for more photos from today's swim.